Learning how to eq vocals in your home recordings can be one of the most intimidating parts of a mix. I mean if you get the vocal wrong, then your song WON’T SELL, you’ll be SHUNNED by your friends and family,LOOSE YOUR HOUSE, and .. and..
Well lets not get dramatic, but you know what I mean! It’s freaking scary man. 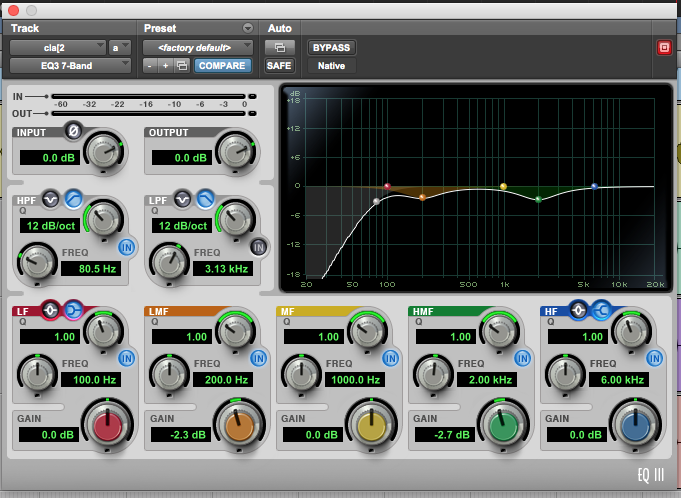 I am going to list out step by step how I go about using an EQ to sculpt my vocal tracks and get them “radio ready”. Why?! Well… I’ll tell you. 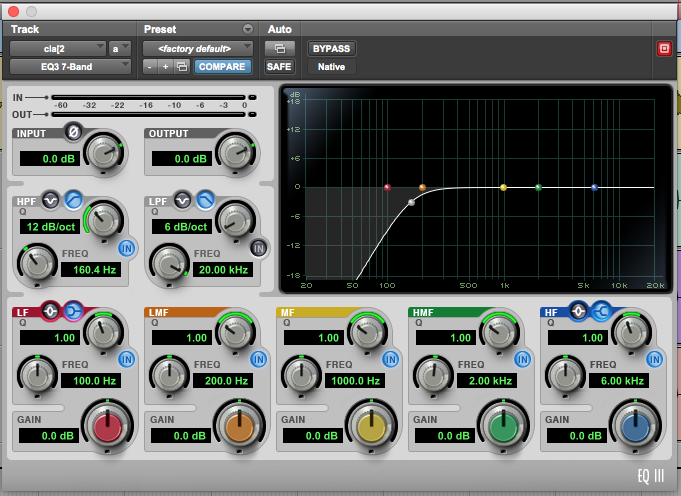 I like to slap on an EQ before a compressor because a compressor will magnify things you don’t want in the vocal. If we don’t get rid of the low frequencies that are not needed, they will crowd up the compressor and make it work harder than needed. 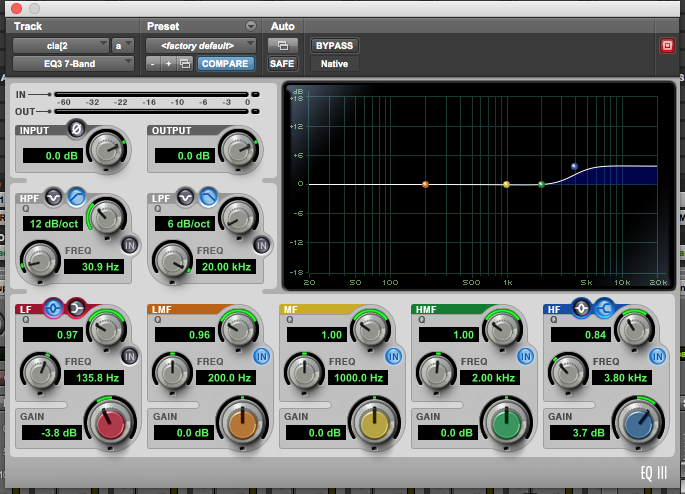 So it’s not the final end all be all rule, but putting the EQ first can save you a lot of headache. So now more on that low end. I can’t tell you how many people struggle with the not being able to out run that nagging “Muddy” mix. A lot of it has to do with too much low end information strewn all across every track in your mix. EQ is all about carving pockets and space for every instrument to sit in. They all need their own little homes to sit nice and cozy in and be happy neighbors. Not be up in each others business. Not every instrument needs to occupy every frequency. It’s our job to go in and clean up this mess. The first thing I do when I slap on an EQ for a vocal is HIGH PASS FILTER it. All a HPF does, is cut out all the frequencies below the frequency you set it at, and then lets the rest above it pass. The Kick drum and Bass guitar art typically the only instruments that need to occupy the super low end of your mix, lets say around 100hz and below. So if that’s the case, you can just cut out 100hz or so and below on every track that is not the Kick or bass. What this does is start to get rid of all that “mud” and clears everything up. Pull open a mix, start with a blank slate (no plugins), get a rough balance, then on every track but kick and bass, roll off 100hz and below. That one move will reveal a huge difference for the better . try it out. I’ll wait. Alright, back to the vocal. Once you HPFed it, Lets to some searching. What I then like to do is start looking around in that low midrange, say 200-350hz range. I don’t like giving you exact frequencies because you need to use your ears. I will just point you in the general area. Every vocal will be different. The technique I like to use to find that low mid range build up that sounds “boomy” or “muffled”, is called sweeping. What I do is boost a low mid frequency band pretty Hight and sweep left and right. I’m looking (with my ears) for that boomy, muffled sound that is clouding up my vocal sound. Once I find it I “destroy” it by just pulling it out about 2-3db. Turning it down instead of boosting. If you haven’t noticed a pattern yet, we are doing a bunch of SUBTRACTIVE eq moves. Meaning we are taking things we don’t like out, instead of boosting frequencies we do like. Which ends up revealing the wanted frequencies anyway. It’s a win win. Subtractive, or reductive eq, whatever you want to call it, results in a more natural sounding result in my opinion. If you start boosting a ton of frequencies, things can start to sound harsh, plus you eat up all your headroom if you eq boost on all your tracks. It adds up fast. We talked about “boomy”, so lets talk about some other adjectives. If your vocal sounds “Nasaly”, “honky”, or “harsh”, try cutting a little at 1-4khz. You’ll get better with practice on identifying these problems. I’m not saying to never boost, I’m just saying be careful and know why you’re boosting. The one place I will almost always boost in a vocal is in the super hight frequencies. If you’ve ever heard the term “adding air” to the vocal, this is what they mean. Using a “shelf” boost like the one in the pic above, is typically how we do this. you shelf boost somewhere around 8khz-10Khz and above. These are just ball park numbers. Some people boost starting as high as 16khz and above. Use your ears. It only takes few dbs of a boost to have the air effect you’re looking for. maybe 2-3 dbs to start. Since we are on the topic of boosting, you can experiment boosting in the mid range around 2-4khz to add some “presence” or “bite” to the vocal. Be careful here though. Things can get painful real quick. A good rule to follow when boosting is to have a slightly wider “Q” setting. The “Q” controls how wide or narrow you cut or boost. A wider Q when boosting will sound more natural than a narrow boost. Keep that in your back pocket of knowledge. There are a lot of different ways on how to eq vocals, but these I’ve mentioned so far have gotten me great results in my home recordings. Again this is my way, how I was taught by some very talented successful engineers. I’m always learning new ways on how to eq vocals. If you always humble yourself and strive to learn new things as you grow in your career, you will be better off and much happier. I hope this helps you in some way. Please comment below and let me know if you had some success with what I’ve discussed today, or if you have any other techniques you would like to share. Remember, It all starts with good recordings. Get it right at the source. So if you can’t make a crappy sounding vocal sound good no matter what you try, maybe you need to record it again. I have a video on how to get a great vocal recording that you can watch here. Also check out the video below to see all this in action on a real vocal. Also, check out this video on recording electric guitar with different mic positions as EQ. Leave a comment below and don’t forget to share this post!